Three long descriptive Autograph Letters Signed, to Charles Watkin Williams-Wynn, in the early days of the publication of national records, sending specimen manuscripts, discussing English historical records and manuscripts, the possibility of their publication, and related matters. 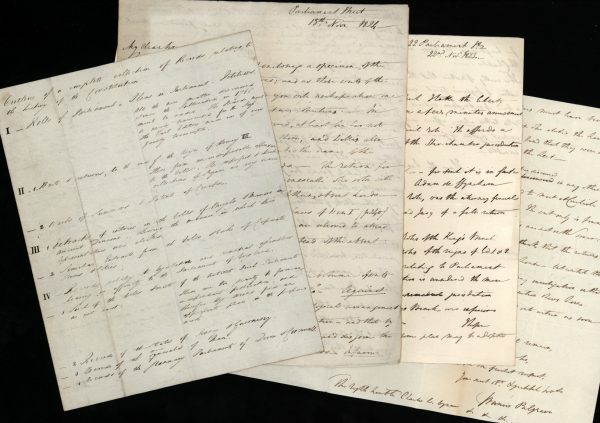 3 letters, 8 pp., with a 2 page manuscript entitled “Outline of a complete collection of Records, relating to the history of the Constitution”. Parliament Street, 1823-24. Sir Francis Palgrave, born Francis Ephraim Cohen (1788-1861), historian. He is best known for his work with what is now the The National Archives, and his numerous publications. In 1822, he had suggested publishing the national records which suggestion was approved, and from 1827 to 1837, he edited a series of volumes. These historical documents focused on medieval history. His works include A History of England (1831), The Rise and Progress of the English Commonwealth (1832), An Essay on the Original Authority of the King’s Council (1834), Truths and Fictions of the Middle Ages: the Merchant and the Friar (1837) and The History of Normandy and England (1851-64, four volumes). The last two volumes of this work were published after his death. Palgrave is also considered the founder of the Public Record Office. Charles Watkin Williams-Wynn (1775-1850) was admitted to the Privy Council in 1822 and appointed President of the Board of Control, with a seat in the cabinet, in the Tory government of the Earl of Liverpool.